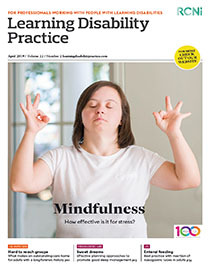 This article outlines the initial training and continuing facilitation of team-based formulation groups in a community team for people with learning disabilities. Training was initially requested by community nurses following a marked increase in challenging behaviour referrals to the team. The formulation groups were attended by professionals from the multidisciplinary team on a bimonthly basis. A questionnaire using open-ended questions was designed to understand why professionals had decided to use formulation, how useful they had found the session, the effect of the session on their clinical work and whether or not service users had benefited as a result. Thematic analysis was undertaken of the data gathered. The ‘master themes’ that emerged were: supportive, reflective, development and learning, planning and confidence. It was also thought that the formulation groups should have protected time in teams to allow for team discussion of service users with challenging behaviour, consistent with the transforming care agenda.